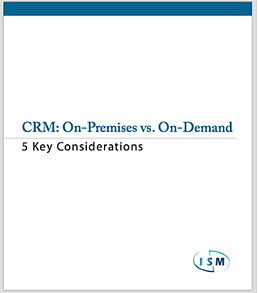 When comparing on-premises vs cloud CRM there are five key considerations to keep in mind. In a recent report, Forrester notes that on-demand (cloud) CRM is becoming the default choice as buyers look to see if this approach meets their needs before they seriously consider an on-premises CRM. A look at the numbers supports that viewpoint. Analysts forecast that, next year, one-third of all spending on customer relationship management software will be for on-demand technology, versus 26 percent in 2010. Information technology analyst Gartner predicts that the CRM market will enter a shake up, as a number of key trends, primarily involving social networks and CRM, begin to take hold. This includes changes to marketing and customer service technologies and the introduction of new projects and implementations. But before you lock down your choice, you need to determine if you can achieve maximum business value from an on-demand CRM solution – or if on-premises CRM will better meet your current and future business objectives. Weigh the benefits of each, and then ask yourself some key questions to help you define what your company really needs and expects from your CRM solution. Get the white paper to learn the five key considerations when comparing on-premises vs. cloud CRM!